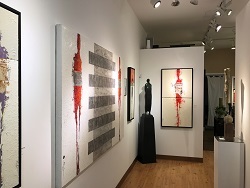 The Gunnar Nordstrom Gallery is a small and intimate space located in center of Bellevue Washington's dynamic shopping district at Bellevue Place. Located adjacent to one of the west coast's premiere shopping malls, Bellevue Square, the gallery is easy to find and is surrounded by first class restaurants, specialty retailers and a five star hotel with an abundance of free or validated parking. 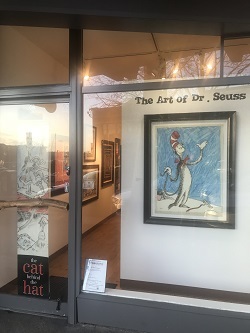 The Gallery first opened in 1991 in the trendy lakeside arts community of Kirkland as a venue for regional painters and printmakers and has become one of the Eastside's oldest galleries. In late 2008, after 17 years in Kirkland, the gallery moved five miles down the road to its swanky and exclusive new location in Bellevue. With an emphasis on whimsical and expressionist work, local patrons frequently choose the Gunnar Nordstrom Gallery as the Eastside’s favorite gallery. The family of artists that continue to show at the gallery are innovative, thoughtful, proficient and immensely talented. While the gallery continues to add new artists to its stable, many of the artists have been in association with the gallery since its beginning where loyalty continues to last and flourish. Quality, playfulness and a good sense of value have always been an important aspect of work exhibited in the gallery and each artist that is represented has their own quality that we believe in. Come visit the Gunnar Nordstrom Gallery, it is a friendly and unimposing gallery of contemporary artwork and a must see while shopping for art in the Seattle area. Come in and let us meet your needs while making new friends. 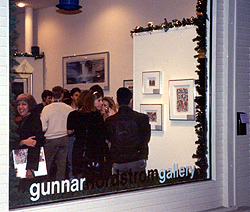 Gunnar Nordstrom Fine Arts was established in 1985 in a small office and showroom in Bellevue as a resource for collectors looking to purchase original prints by International artists such as Chagall, Miro, Motherwell, and Warhol from a competent and honest art dealer in the Pacific Northwest. The journey from an office and showroom in Bellevue to a gallery in Kirkland and back again to Bellevue has been an exciting and rewarding experience that rewards every collector of the gallery with the experience of an art dealer well informed and familiar with the art market. Previously, Gunnar Nordstrom had graduated from Washington State University with a degree in Fine Arts and Education. After two years of teaching Social Studies and Washington State History in Vancouver, Washington, he spent the next 3 years with a regional gallery in Bellevue as director. Learning the art business in a fast paced, highly merchandised gallery, it didn’t take long before defining a direction and moving on to open an office and showroom of his own. The first location was on Lake Bellevue in a lovely office suite with a small showroom. It was here that the educational emphasis of his philosophy was born. During the next 5 years, Gunnar Nordstrom drew upon his teaching experience and love of art to educate his clients on a variety of subjects associated with the art world. Using case shows and outside dealers in a controlled environment, he regularly held formal presentations of artwork that were overwhelmingly appreciated and successful. During these case shows, collectors where educated on the variety of mediums, styles and accessibility of collectable art. Many of the dealers that Gunnar aligned himself with for these shows were also of the same integrity as he and offered a wonderful selection of international artwork at good values that weren’t readily available in Seattle galleries. 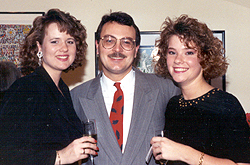 Coming to an evening show at Gunnar Nordstrom Fine Arts was an event that was looked forward to by many clients. How often can you be entertained for an evening by the likes of Picasso, Miro, Chagall, totally new artists on their rise to stardom or learn how a mezzotint is created. 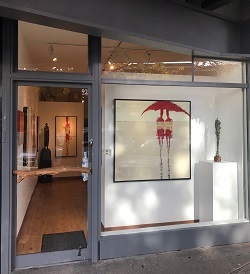 With the blossoming regional art scene the Gunnar Nordstrom Gallery was established in 1991 in the heart of trendy downtown Kirkland on the waterfront to showcase some of these outstanding painters and printmakers. While it was difficult to leave Lake Bellevue and “the womb”, it was a necessary move to grow and flourish. The first show at Gunnar Nordstrom Gallery was a solo exhibit by nationally known painter Loren Salazar. The show was a huge success and Salazar continues to be represented by the gallery to this day. The gallery continues to offer all of its services of the past, such as on going case shows and educational seminars as well as additional ability to rotate excellent regional and International artwork through the gallery 12 times each year. 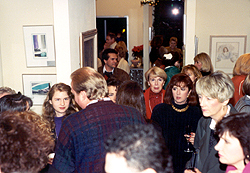 During the gallery's 17 years in Kirkland, Kirkland grew from 2 galleries when Nordstrom arrived to as many as 17 in the late 1990's. The beautiful waterfront community which is only 10 minutes (without traffic) from downtown Seattle was looked upon as an Arts destination and had an excellent selection of artwork with each gallery specializing in something different. But like many things, all good things come to an end and by late 2008, the gallery scene in Kirkland had dwindled to 3 galleries and Nordstrom decided to move to the swanky and business friendly environment of downtown Bellevue. The Bellevue location is situated between first class restaurants, furniture stores, specialty retailers and the Hyatt Hotel, not to mention only a sky bridge away from the famous Bellevue Square. The new location is truly an exciting and vibrant space fitting of fine art and collectibles. Gunnar Nordstrom doesn’t stop at only running the gallery, but participates actively in the community. He is a founding board member of the KDL (Kirkland Downtown on the Lake) the local Mainstreet merchants association, a past board member of the Kirkland Arts Center a non profit arts education facility housed in the historic Peter Kirk building, a representative on the DAT (Downtown Action Team) formed from the Strategic Planning Commission for a “future vision of downtown Kirkland” and he is a past officer of the Kirkland Gallery Association where he has been an active member since 1991. Being a part of the community is an important as aspect to any retailer in a city and Gunnar Nordstrom not only believes that, but acts upon it with enthusiasm. What is next the next step for Gunnar Nordstrom…Check the Gallery News for current updates. Monday - Saturday 9:30 a.m – 8:00 p.m. The gallery offers services to meet the needs of collectors regionally and abroad. Please sign our guest book and include your preferred form of notification. We'll be glad to call, or send a note or email to tell you about upcoming shows and events. And, if you would like us to help track down a favorite artists work, we'd be happy to help with that too (of course all information you provide will be kept strictly confidential). If you have any questions prior to registering for the mailing list, please email us. If you have any questions prior to registering for the mailing list, please email us. 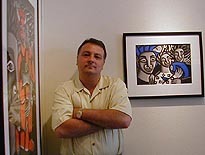 The Gallery is located in the heart of downtown Bellevue at 800 Bellevue Way N.E. Suite 111, Bellevue, Washington 98004. The easiest cross street address is Bellevue Way N.E. and N.E. 8th Street, just north east of Bellevue Square and north of Lincoln Square. You will find us next to Joey's Restaurant, BoConcept Design, adjacent to Koral Bar and Kitchen and on the courtyard of the Hyatt Hotel. There is free parking under ground every evening and on weekends and 3 hours of free parking during the weekday with a validation. There is also free parking at Bellevue Square and two sky bridges to Bellevue Place. For those of you preferring a bit easier route to the gallery, there is Valet parking available for your convenience directly in front of the gallery at the entrance to the Hyatt Hotel. The staff at the Hyatt will take very good care of you, just as you would take very good care of them.